When you die in your dream, do you really die? Amber Lavery knows she’s sick—or crazy. For years she’s had visions of people and creatures that aren’t really there. But when Michael, the smartest kid in her class, reveals a wonderful secret, Amber learns that these visions give both of them special abilities in the world of dreams. 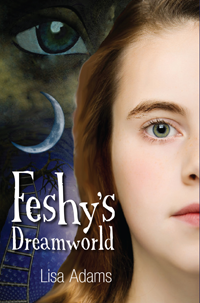 Together, Amber and Michael venture into the ever-changing dreamworld, the home of all their fantasies and fears—and a magical creature named Feshy. With Feshy’s friendship comes extraordinary power—the power to destroy their enemies, to control people’s dreams, maybe even to find Amber’s missing father. OOOOOH, you're freaked out, aren't you? I KNEW IT! Well, don't worry. it's a good little book.